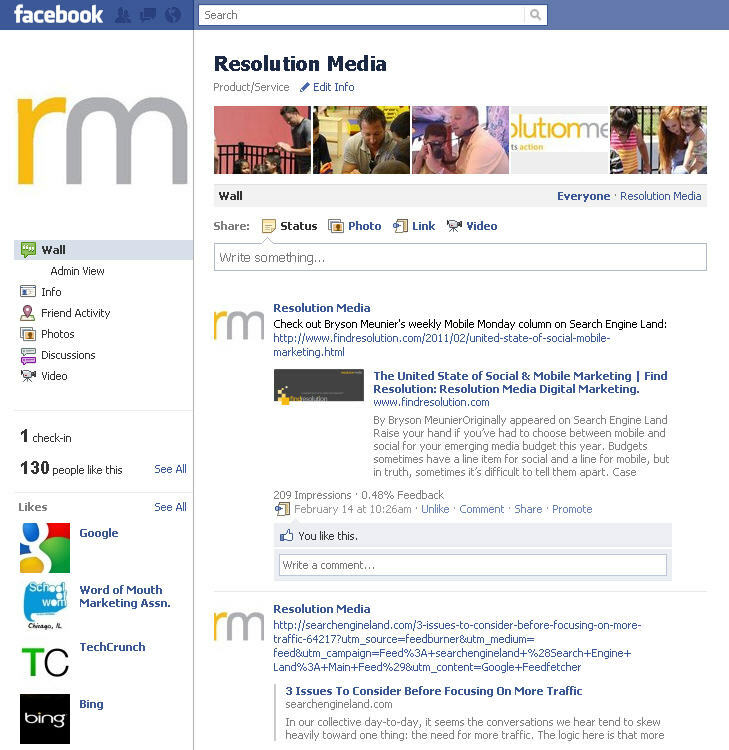 About a week ago, Facebook announced changes to Facebook pages. FBML (Facebook Markup Language) is being phased out and as of March 11, 2011 there will no longer be the ability to create new FBML apps for pages. Instead, Facebook is going to be relying on Iframes for its apps, which is great news. FBML was difficult to work with and making new, custom apps will rely entirely on HTML. Iframes mean that the content will be living on an external website. Since this is the case, in theory, we should be able to add tracking codes like Google Analytics or Omniture and get more data than we were able to before. This is a huge WIN in the integrating search and social realm. The overall look of the Facebook Fan Page is different. It looks a lot more like a personal page than anything. Which is good to keep consistency. It also looks cleaner and more professional. The tab section at the top is gone. This will now be replaced by images (like the ones on the personal pages). This isn’t a huge difference as they will still be available on the left side and fully customizable. But the addition of the pictures allows for more customization and creativity. There are many examples of customizing the Facebook image (more cool examples via Mashable). Better usability for the admin of the page. Admin’s can get email notification when changes when comments or posts are made which is a nice little perk to stay up to date on happenings. I know I have already started getting these for a number of the pages I am an admin for. And on that same note, as an admin, we can now make comments on these posts as individuals and help promote the content. Previously this showed up as the client page making a comment. Now there is the ability to switch between the two which IMHO is awesome. (I guess this starts to border on the giving full disclosure issue by the FTC). Sounds promising. Here is an article from Hubspot giving a walkthrough on how to setup iframes, in case anyone asks. I am sure there will be many more articles on this subject to come.